Following is the current list of all Hal Schram Mr. Basketball winners dating to the award’s inception in 1981. Also listed are the college the player attended along with short biographies of the Detroit PSL recipients. The Mr. Basketball Award is presented annually by the Basketball Coaches Association of Michigan and is named in honor of the late Hal Schram, a sports writer at the Detroit Free Press who covered high school sports for 40 years before retiring in 1983. The 6-foot-2 Appling, who averaged 28 points, six rebounds, five assists, and three steals and led Pershing to a second-straight PSL and Operation Friendship title this year, became the fourth Doughboy to win the honor of Mr. Basketball. Previous winners were Appling’s future MSU teammate Derrick Nix (2009), Winfred Walton (1996) and Willie Mitchell (1994). “He’s a humble kid and totally unselfish,” Pershing coach A.W. Canada told the Detroit Free Press. “… He has a quiet spirit but has the tenacity of a lion. He’s a killer on the court and a gentleman off the court.” Appling made his case for this year’s award during the 2009 Class A state championship game against Kalamazoo Central when he broke Antoine Joubert‘s (Southwestern/Mr. Basketball 1983) record with 49 points during the Doughboys’, 90-73, victory. The 6-foot-5 Harris averaged 33.5 points and 12 rebounds per game in leading his Huskies to the Class A state championship game (they lost to Saginaw, 79-57). Along the way, Harris collected 52 points against Henry Ford and was the first PSL player since Jalen Rose and Voshon Lenard (Southwestern 1989-91), to start on three consecutive PSL Championship teams. The 6-foot-4 Harris averaged 24.6 points and 8.7 rebounds per game his senior year. Harris helped lead Redford to Class A state championship game his juniors season but the Huskies lost to Pontiac Northern, 66-58. A four-year player at Redford, Harris won a PSL title as a sophomore and lost in the finals as both a freshman and senior. Perhaps one of Harris’ biggest claims to fame as a prep was three inter-state matchups with Akron St. Vincent-St. Mary’s and its star LeBron James. Harris and the Huskies lost all three games. The 6-foot-9 Walton averaged 28 points, 16 rebounds, and six blocked shots per game. He edged Flint Northern’s Mateen Cleaves by a mere 13 points for the honor. Formerly at Detroit East Catholic, Walton spent his junior and senior seasons at Pershing where he helped the Doughboys win consecutive PSL championships. The 6-foot-9, 300-pound Traylor averaged 23 points, 15 rebounds, and shot an astounding 65-percent from the field his senior season. As a junior he led the Pilots to PSL and Class A state championships. 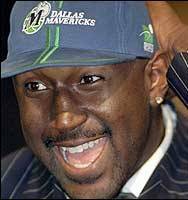 Following three seasons at the University of Michigan, Traylor was drafted sixth overall by the Dallas Mavericks and was traded shortly thereafter to Milwaukee for the rights to 2007 NBA MVP Dirk Nowitzki and Pat Garrity. The 6-foot-8 Mitchell averaged 21.9 points and 11 rebounds his senior season. Most remarkably, perhaps, is that during his four-year career at Pershing the Doughboys posted a 92-11 record and won consecutive Class A state championships (1992 and 1993) and reached the finals again in 1994 before losing to PSL rival Murray-Wright, 80-73. The 6-foot Talley averaged 21.6 points, four assists, and three steals as a senior. His biggest accomplishment, however, is the fact that he and teammate Daniel Lyton are the only Class A players in state history to win three straight state championships (1987-89). In doing so, Cooley bested arch-rival Southwestern in the 1987 and 1989 finals. He put an exclamation mark on his prep career during the 1989 final when he scored 27 points on 10-of-13 shooting and dished out eight assists in the 85-73 victory over the Prospectors. The 6-foot-5 Joubert averaged 31.9 points, 14 rebounds, and seven assists his senior year and was easily one of the most decorated PSL players in state history. Along the way he became the first Class A player to score over 2,000 points in his career. Joubert finished with 2,208 career points, still good for 11th all-time in state history. His 47 points in Southwestern’s 84-80 Class A state championship loss to Flint Central in 1983 stood as a championship game record until Pershing’s Keith Appling poured in 49 in 2009.